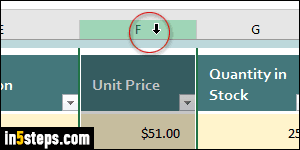 Click on a column header to select all the cells it contains: notice how your cursor becomes a down arrow. 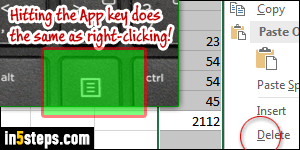 Tip: hitting the delete key (Del) on your keyboard will clear the cell values, but this won't remove the column! 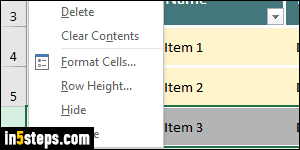 To do so, right-click on the column header and pick Delete from the context menu. Delete a column with a keyboard shortcut! Using the mouse, you can delete a row just like you deleted a column. 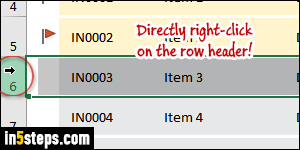 Right-click on the row header (screenshot), and select "Delete" in the menu. Delete a row using your keyboard only! Once the active cell is in the row you want to delete, hit Esc. Then, hold down the Shift key and press the space bar to select that row. Hit the App key and hit the letter "D". Note: you can always hit the Undo button or hit Ctrl+Z (Windows) Command+Z (Mac OS X) to restore a deleted row or column!